Image caption Jamie McDonald raised £148,000 along the way for "sick kids who need life-changing operations"
A "superhero" adventurer has finished a 5,500-mile run across the United States. 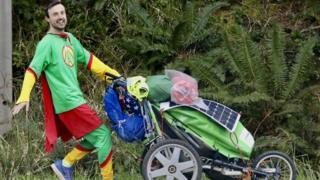 Jamie McDonald, from Gloucester, ended his 11-month marathon in Gloucester, Massachusetts, dressed as "Adventureman" and pushing a pram. The 32-year-old has raised £148,000 along the way for "sick kids who need life-changing operations". Broadcasting on Facebook, Mr McDonald said: "I just want to say - America, I couldn't have done it without you." The former tennis coach started his challenge last year by dipping his hand in the Pacific Ocean at the most western point of the US. On Wednesday, he ran his final six miles to Fort Point in Gloucester, where he ran fully clothed into the ocean. "I'm a Gloucester boy so to finish in Gloucester is really special," he said. "When I ran through on my final marathon it was just electric. All the cars were honking their horns - it's mind-blowing to make it and get here." Mr McDonald, who previously completed a year-long run across Canada and cycled from Bangkok to Gloucester, is due to return to Gloucester in a week to try and break the Guinness World Record for the greatest distance covered on a treadmill. "It's in one spot and it means the whole community of my home town can get together, can join me," he said. Mr McDonald suffered from syringomyelia as a child and, after raising money for hospitals and children's charities, set up his own Superhero Foundation, which gives grants for medical treatment unavailable on the NHS.